How do we define textual analysis? When we perform textual analysis on a text, we make an educated guess at some of the most likely interpretations that might be made of that text. We interpret texts (films, television programmes, magazines, advertisements, clothes, graffiti, and so on) in order to try and obtain a sense of the ways in which, in particular cultures at particular times, people make sense of the world around them. And, importantly, by seeing the variety of ways in which it is possible to interpret reality, we also understand our own cultures better because we can start to see the limitations and advantages of our own sense-making practices. 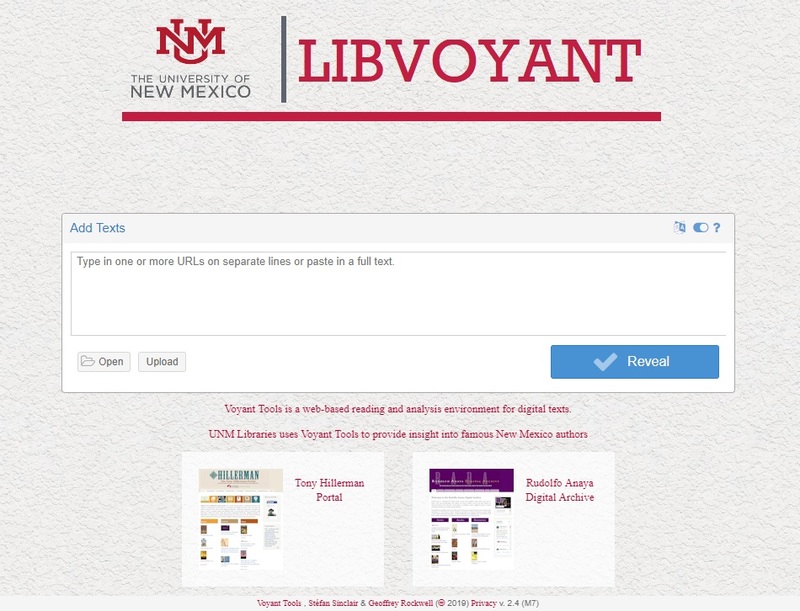 What can I do with the UNM Libraries LIBVOYANT system? DISC Graduate Fellows have spearheaded the text analysis effort, and made the LIBVOYANT project possible. Students have completed OCR processing and quality assurance on six important manuscripts by Rudolfo Anaya and Tony Hillerman. To date, manuscripts for Anaya's Bless Me, Ultima (almost complete), Tortuga, and Heart of Aztlan have been TEI encoded so they can be visualized and compared using the LIBVOYANT server. Also, Tony Hillerman's Blessing Way, The Fly on the Wall, and Dancehall of the Dead have also been encoded for online processing. On the LIBVOYANT home page, simply click the OPEN button and select which author's work you would like to visualize. In addition, you can also upload your own cleaned, plain text or TEI encoded documents to LIBVOYANT so you can use the visualization tools on other works.